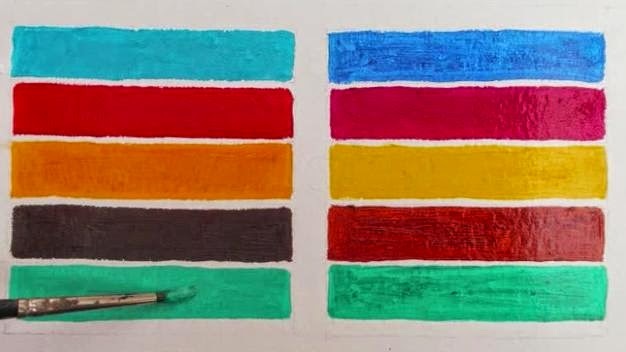 Glazing oil paints is one of the chief techniques in oil painting. The aspiring artist might be lead to believe that glazing can only be done like the old masters, requiring many paint layers, linseed oil and hours of work. But anyone can learn about this great oil painting technique with just basic art materials and a couple of hours. Some oil colors are more translucent than others by their nature. However, pigments with high opacity can be made translucent by the addition of a little linseed oil. I have therefore chosen oil colors of varying translucency for this art demonstration, which can be found on my art instruction video clip. All that is needed are: a primed piece of card, measuring approx 10x8in or so. Notice on the left side of the image, I have placed oil colors which are relatively opaque. These are (from the top): cerulean blue, cadmium red, cadmium yellow, burnt umber and viridian mixed with a little white. White will add opacity to any color (as viridian is translucent on its own). On the right of the image, I have placed oil colors that are relatively translucent. These are from the top): ultramarine blue, permanent rose, lemon yellow, burnt sienna and viridian neat. Also needed for this art exercise are linseed oil and fine sables. Notice that these colors have been placed in long stripes of equal length. 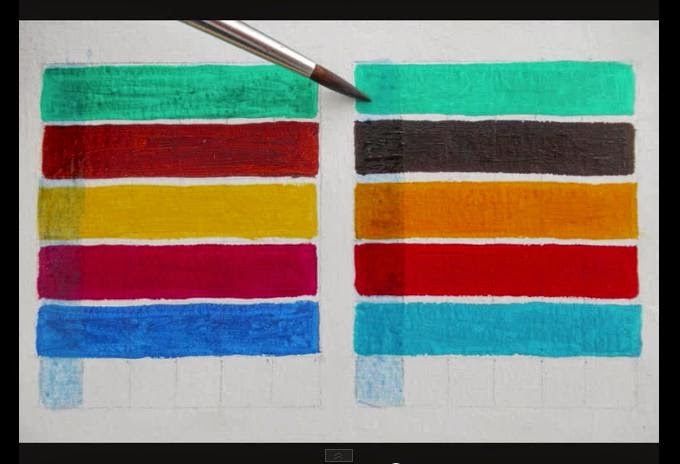 This permits the application of different overlying colors to see how each affects the appearance of the underlying color. I had applied each pigment neat on primed card and allowed them to dry for at least ten days. Some pigments dry quicker than others. Lemon yellow is particularly lengthy to dry. Once enough time has elapsed for each oil pigment to become touch-dry, I will apply only those that are naturally translucent over the top. I will add a little linseed oil to increase translucency. As can be seen here, I began with ultramarine, adding a few drops of linseed oil into a wide receptacle first. I will add this blue in a vertical stripe so that it goes over each underlying color. Notice how it affects the appearance of each underlying pigment, almost like tinted glass. Now repeat this procedure for the other oil colors, cleaning the brush between each application. 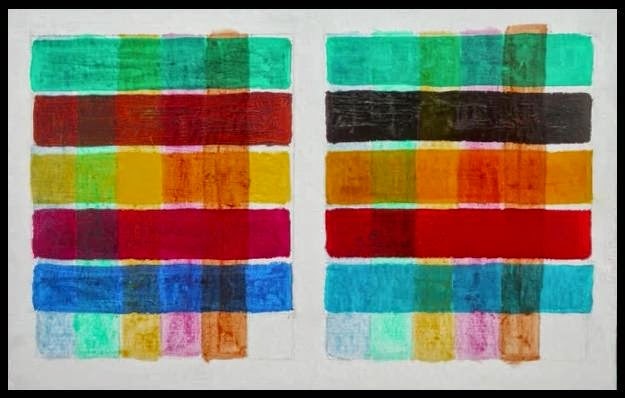 I applied in similar fashion: viridian green, lemon yellow, permanent rose and burnt sienna. The close up view shows how each color has been affected by the overlying glaze. Some warm colors will appear cooler, some cool colors will appear warmer. In other cases, the color will appear darker. 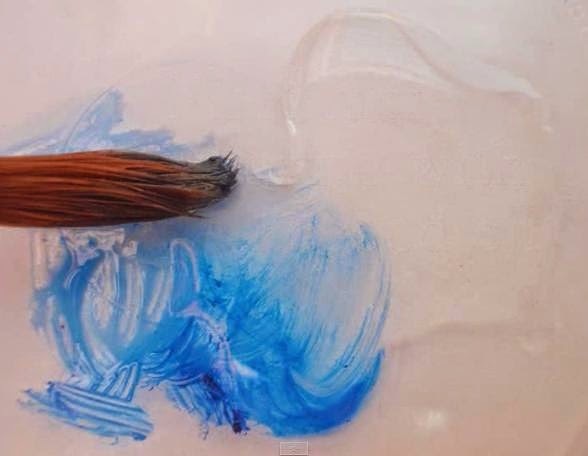 Glazing with oils can be used to inject mood into a painting or to deepen colours, create smooth effects, which can be great for skin colors expanses of sky or reflections. 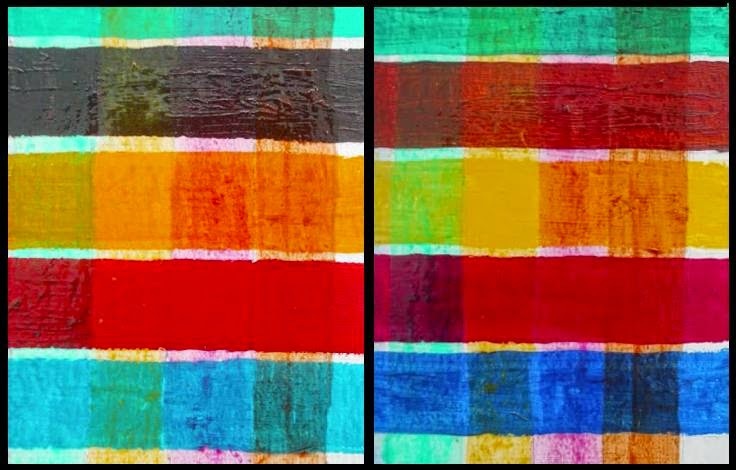 Practice this glazing exercise to see how the appearance of a color is affected by the application of diluted oil paint on top.